04/22/13 Hyundai motor company (hyundai) is recalling certain model year 2006-2009 accent, model year 2007-2011 azera, sonata and sante fe,2006-2011 tucson, 2009-2011 elantra touring, 2007-2010 elantra, 2008-2011 veracruz, 2009-2011 genesis, 2010-2011 genesis coupe, 2007-2008 entourage, and 2006-2008 tiburon vehicles. originally, in april 2013, hyundai recalled 1,059,824 model year 2007-2009 accent and tucson, model year 2007-2010 elantra, model year 2007-2011 santa fe, model year 2008-2009 veracruz, model year 2010-2011 genesis coupe, and model year 2011 sonata vehicles. in september 2013, hyundai informed the agency that it was adding more vehicles to this campaign, representing an additional 652,512 units. the total number of vehicles being recalled is now 1,712,336. in the affected vehicles, the stop lamp switch may malfunction. a malfunctioning stop lamp switch may cause the brake lights to not illuminate when the brake pedal is depressed or may cause an inability to deactivate the cruise control by depressing the brake pedal. additionally, a malfunctioning stop lamp switch may also result in intermittent operation of the push-button start feature, affect the operation of the brake transmission shift interlock feature, preventing the shifter from being moved out of the park position and cause the electronic stability control (esc) malfunction light to illuminate. 06/29/09 Hyundai is recalling 532,633 my 2006-2007 accent, entourage, sonata, my 2007 azera, elantra and santa fe, my 2005-2007 tucson and my 2007-2008 veracruz vehicles. the stop lamp switch in the affected vehicles may malfunction. a malfunctioning stop lamp switch may cause the brake lights to not illuminate when the brake pedal is depressed or may cause the brake lights to remain illuminated when the brake pedal is released. a stop lamp switch malfunction may also affect the operation of the brake-transmission shift interlock feature so the transmission shifter would not be able to be shifted out of the park position. it may also cause the electronic stability control (esc) malfunction light to illuminate, and it may not deactivate the cruise control when the brake pedal is depressed. Any of these malfunctions, alone or in combination, may lead to a crash. Dealers will replace the stop lamp switch free of charge. 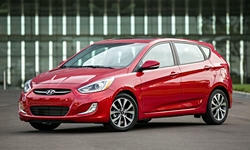 the recall began on june 29, 2009. owners may contact the hyundai customer assistance center at 1-800-633-5151. Hyundai recall no. 092.owners may also contact the national highway traffic safety administration's vehicle safety hotline at 1-888-327-4236 (tty 1-800-424-9153), or go to http://www.safercar.gov . 10/21/15 Electrical and Air Conditioning Hyundai motor america (hyundai) is recalling certain model year 2009-2011 hyundai accent vehicles manufactured march 1, 2009, to february 11, 2011. in the affected vehicles, the brake light switch may malfunction. a malfunctioning brake light switch may cause the brake lights to not illuminate when the brake pedal is depressed or may cause an inability to deactivate the cruise control by depressing the brake pedal. additionally, a malfunctioning brake light switch may also prevent the shifter from being moved out of the park position. 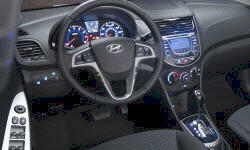 Hyundai will notify owners, and dealers will replace the brake switch, free of charge. the recall began on october 21, 2015. owners may contact hyundai's customer service at 1-855-671-3059 or by visiting www.hyundaiusa.com/campaign131. hyundai's number for this recall is 131. this recall is an expansion of 13v-113. 06/04/15 Electrical and Air Conditioning Hyundai motor america (hyundai) is recalling certain model year 2015 accent vehicles manufactured september 15, 2014, to february 10, 2015. in very cold temperatures, the occupant detection system (ods) may not be able to determine if a child restraint seat is in the front passenger seat. If the ods fails to detect that the seat is occupied by a child restraint seat, the front air bag will not be deactivated and, in the event of a crash necessitating front air bag deployment, the air bag deployment could cause increased risk of injury to the occupant in the child restraint seat. Hyundai will notify owners, and dealers will correct ods software, free of charge. the recall began on june 4, 2015. owners may contact hyundai customer service at 1-855-671-3059. hyundai's number for this recall is 129. 04/22/13 Electrical and Air Conditioning Hyundai motor company (hyundai) is recalling certain model year 2006-2009 accent, model year 2007-2011 azera, sonata and sante fe,2006-2011 tucson, 2009-2011 elantra touring, 2007-2010 elantra, 2008-2011 veracruz, 2009-2011 genesis, 2010-2011 genesis coupe, 2007-2008 entourage, and 2006-2008 tiburon vehicles. originally, in april 2013, hyundai recalled 1,059,824 model year 2007-2009 accent and tucson, model year 2007-2010 elantra, model year 2007-2011 santa fe, model year 2008-2009 veracruz, model year 2010-2011 genesis coupe, and model year 2011 sonata vehicles. in september 2013, hyundai informed the agency that it was adding more vehicles to this campaign, representing an additional 652,512 units. the total number of vehicles being recalled is now 1,712,336. in the affected vehicles, the stop lamp switch may malfunction. a malfunctioning stop lamp switch may cause the brake lights to not illuminate when the brake pedal is depressed or may cause an inability to deactivate the cruise control by depressing the brake pedal. additionally, a malfunctioning stop lamp switch may also result in intermittent operation of the push-button start feature, affect the operation of the brake transmission shift interlock feature, preventing the shifter from being moved out of the park position and cause the electronic stability control (esc) malfunction light to illuminate. 09/02/09 Electrical and Air Conditioning Hyundai is recalling 3,011 model year 2005-2007 elantra, tucson, sonata, azera and accent vehicles. a malfunctioning stop lamp switch may cause the brake lights to fail to illuminate when the brake pedal is depressed or may cause the brake lights to remain illuminated when the brake pedal is released. a defective stop lamp switch may also affect the operation of the brake-transmission shift interlock feature so the transmission would not be able to be shift out of the "park" position. it may also cause the electronic stability control (esc) malfunction light to illuminate, and it may not deactivate the cruise control when the brake pedal is depressed. Dealers will replace the stop lamp switch free of charge. the recall began on september 2, 2009. owners may contact hyundai of puerto rico customer service at 1-787-999-4310. Hyundai of puerto rico recall no.91b026.owners may also contact the national highway traffic safety administration's vehicle safety hotline at 1-888-327-4236 (tty 1-800-424-9153), or go to http://www.safercar.gov .